In last months newsletter I noted that the bright star Alpheratz, shown above, is shared between the constellations Pegasus and Andromeda. 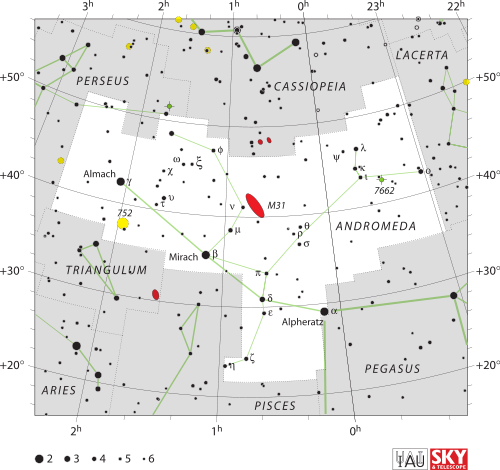 Andromeda is famous for containing the Andromeda galaxy, shown as the red oval marked M31 above, within its boundaries. The Andromeda Galaxy is the largest galaxy of the Local Group, which also contains the Milky Way, the Triangulum Galaxy, and about 30 other smaller galaxies. Although the largest, the Andromeda Galaxy may not be the most massive, as recent findings suggest that the Milky Way contains more dark matter and could be the most massive in the grouping. The 2006 observations by the Spitzer Space Telescope revealed that M31 contains one trillion (1012) stars: at least twice the number of stars in the Milky Way galaxy, which is estimated to be 200–400 billion. The Andromeda Galaxy is approaching the Milky Way at about 100 to 140 kilometres per second (62 to 87 mi/s) which is about 1.96 billion to 2.74 billion miles per year, making it one of the few blueshifted galaxies. The Andromeda Galaxy and the Milky Way are thus expected to collide in about 4.5 billion years, although the details are uncertain since Andromeda's tangential velocity with respect to the Milky Way is known to only within about a factor of two. Two scientists with the Harvard–Smithsonian Center for Astrophysics stated that when, and even whether, the two galaxies collide will depend on Andromeda's transverse velocity. Based on current calculations they predict a 50% chance that in a merged galaxy the solar system will be swept out three times farther from the galactic core than it is currently located. They also predict a 12% chance that the Solar System will be ejected from the new galaxy some time during the collision. Such an event would have no adverse effect on the system and chances of any sort of disturbance to the Sun or planets themselves may be remote. Without intervention, by the time that the two galaxies collide, the surface of the Earth will have already become far too hot for liquid water to exist, ending all terrestrial life, which is currently estimated to occur in about 1.4 billion years due to gradually increasing luminosity of the Sun. Jupiter is bright in the eastern sky at viewing time, close to the bright star Aldebaran, Alpha Tauri, in the ascending constellation of Taurus.